Where I live, there is an abundance of apple trees growing untended on public property. Local ordinances allow anyone to pick the apples, and still most of them do to waste – although I do my part that from happening. I sometimes make cider, too – and still have more apples leftover. During one such bountiful year, I started making apple chutney. It’s a sweet-and-sour condiment that goes well with meats, tempeh and strong cheeses – think of a classier, chunkier version of ketchup. 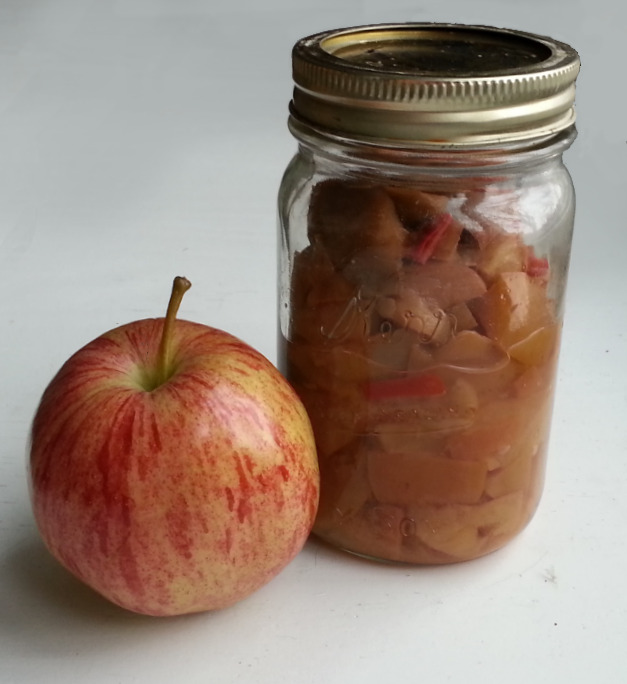 Like ketchup, most recipes for apple relish and apple chutney are loaded with sugar (about ½ cup per pint of relish). You may think that all that sugar is necessary to preserve the chutney, but it’s not. The vinegar in the recipe, combined with the process of canning the chutney in a boiling water bath or pressure canner, is sufficient. My recipe still calls for sugar to balance out the sourness of the vinegar, but it’s less than half of what you’ll find in other recipes. Below you have two options: a large recipe for canning, and a smaller one if you want to refrigerate your chutney. Heat jars in a canner by bringing water to a boil, or by running through the dishwasher. If you plan to can the chutney, select and heat lids according to these instructions. Mix liquids with sugar, salt and spices. Bring to a boil. Add fruits and vegetables. Reduce heat to medium-low. Cook until apples are heated through (a couple minutes after liquid begins to simmer again). Ladle into hot, clean mason jars. If canning: add 2-piece lids and rings, and process in a boiling water bath for 10 minutes or under 5 pounds of pressure in a pressure canner for 5 minutes. Put on a cooling rack and allow to cool at room temperature. If refrigerating: Ladle into clean, hot jars (heating them prevents them from cracking when you add the hot chutney). Let cool on a cooling rack for half an hour. Add lids and refrigerate. If it’s still more than you can eat by yourself, freeze some or give some chutney to your friends. * I cook the cores in one crockpot, and in another I cook the skins and blemished apples (roughly chopped with cores removed). Once cooked, I strain the seeds out of the cores using a Victorio Food Strainer . I puree the blemished apples and skins, mix everything together, then can according to the directions on the National Center for Home Food Preservation’s website. Those will produce less of a humble beige color than my preferred recipe.